The entrance to Pape Nature Park is announced by a small gate in-between tree lines in an otherwise uninterrupted landscape. Passing through the gate two little structures appear as pitched roofs sitting close to the land. Only by walking closer do they appear as a much larger building curving through the land. When standing near the steps towards a sunken entrance, the Gateway to Pape Nature Park appears as an Earth Building. To enter the park one enters land itself. The sweeping roof draws a stepped garden allowing air and light to penetrate the underlying spaces and opening on spectacular views of the surrounding landscape. 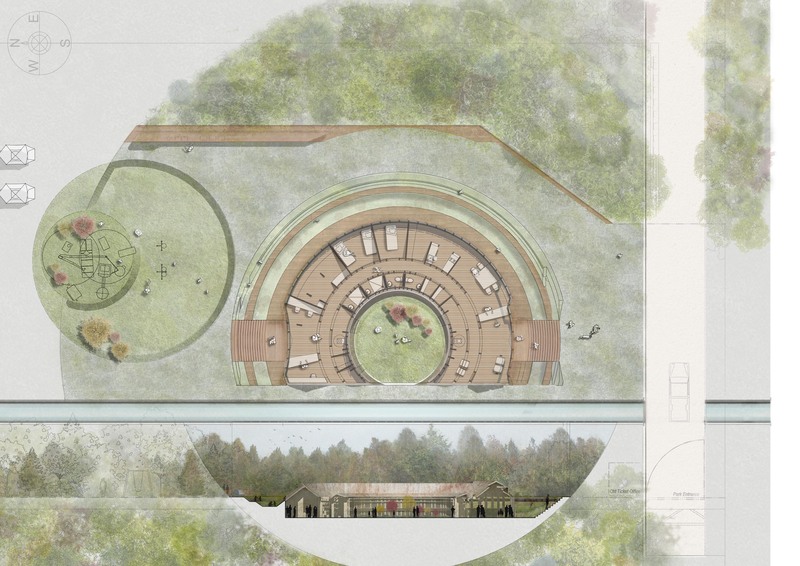 This plateau of roof-land collects water, allows plants to grow and children to play. The central courtyard is a garden filter treating grey water. The surrounding soil, in which the building is half sunken, mediates between the interior and exterior, regulating the inside temperature both in winter and in summer, during the day and the night. Complementing the earth-walls, timber columns and roof wooden beams form the interior as an open gallery overlooking the natural landscape and the green central courtyard. A continuous circular walkway connects the two entrances on either side of the Gateway. Each entrance with a large fireplace as a ceremonial beacon and a source of warmth. The building interior accommodates working lounges, information desks, sleeping quarters, kitchen and bathrooms in support of what happens outside. A campsite connects to the Gateway Building with a playground and open kitchen area.